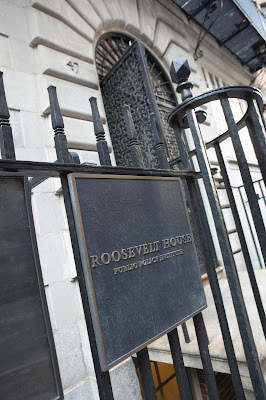 Wednesday evening, the Saint David's community had the rare opportunity to participate in a special event at the Roosevelt House about the recent PBS Documentary and book The Roosevelts: An Intimate History. 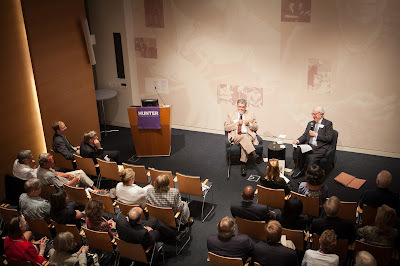 The evening took the form of a lively, erudite conversation between two Roosevelt experts: Ambassador William vanden Heuvel who is Founder and Chair Emeritus of the Franklin and Eleanor Roosevelt Institute and of the Franklin D. Roosevelt Four Freedoms Park on Roosevelt Island, and Mr. Geoffrey Ward, award-winning historical author and writer of the highly acclaimed Ken Burns' documentary about Teddy, Franklin, and Eleanor Roosevelt. Their discussion painted fascinating portraits of all three Roosevelts, and ranged from their personal struggles: FDR's with polio, Eleanor's with an unloving childhood and depression, and Teddy's with asthma and depression; to their courage in fighting for the ideals in which they believed, embodied by their efforts in conservation and in the New Deal social programs proposed by Teddy which were brought into fruition under FDR, and in Eleanor's success with the Universal Declaration of Human Rights, adopted by the UN in 1948. To be sitting in the Roosevelt House, with FDR's Four Freedoms etched into the wall behind us, while benefiting from the knowledge and insights of the speakers in front of us, was to be literally enveloped in the ideas and ideals that guided the Roosevelts decades ago, and which remain ever more relevant and vital today. My appreciation on behalf of Saint David's to the Alumni Parents Council led by Dorothy Faux and Linda Foran, and to the Ambassador and Mr. Ward, for providing our community with an evening to remember and long ponder. It was a phenomenal night. Making thinking more visible to promote increased engagement, understanding, and independence in our boys' learning has been a focus of the curriculum this year. 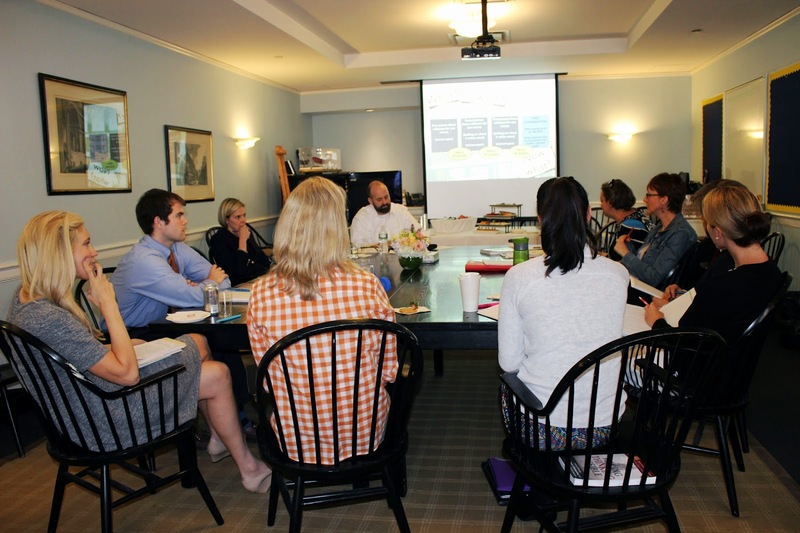 Last week, small groups of Saint David's faculty members met with leading neural development and learning specialist Mark Church for follow-up workshops on strategies they are implementing in their classes to make their students' thinking more visible. Mark, author of "Making Thinking Visible," and part of the team at Harvard University's Project Zero, began working with Saint David's a year ago and has made periodic visits to the school throughout the year. 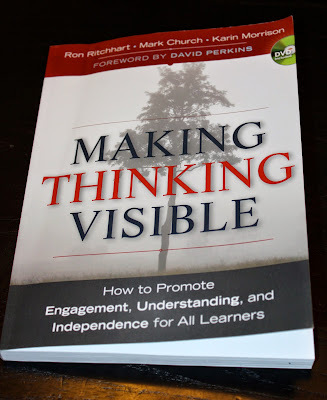 During last week's session, he led the faculty members in discussion and analysis of their use of various routines that help boys to develop thinking habits, to be "reasoners with evidence" and "connection makers," rather than information absorbers. These range from simply changing the question "Why,"to "What made you say that?" when seeking to reveal a boy's reasoning about a topic, to having the boys document their thinking in a visual manner. It is essential for true scholars to go beyond acquisition of knowledge to experience more generative learning that leads to development of new ideas and solutions to novel problems. As a school, we implement many ways for our boys to engage in deeper level thinking, whether in the classroom, the science lab, through our several learning partnerships with prestigious educational, cultural, and scientific organizations, or on the many class field experiences the boys partake of during the year. The art, craft, and science of teaching is a principal focus of our professional development at Saint David's. Saint David's annual Spring Art Show is bringing additional color and beauty to our school. 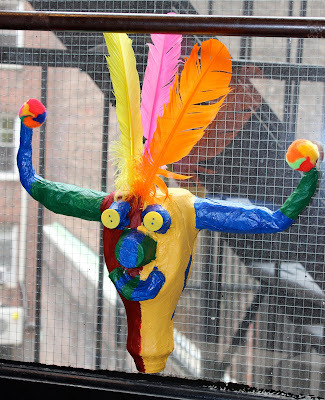 The show is rich with work the boys have accomplished in art, which involves acquiring artistic skills as well as studying the ouevre of famous artists and art from various cultures. 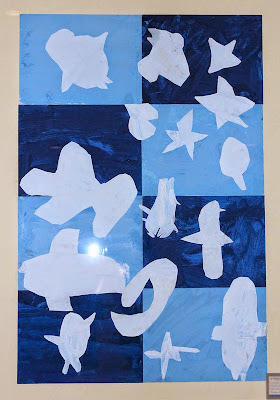 A few examples: Kindergartners were inspired by Matisse's cut-out collages; second graders created tribal masks after viewing masks of non-Western cultures and learning about symmetry, exaggeration, pattern, contrast, and color mixing. First graders looked at patterns in the world and reproductions of the tribal art of Ghana and Australian aboriginals to create patterned animals with patterned backgrounds; fifth graders studied anthropomorphic and zoomorphic pots from Latin and South America before creating vessels that combined form and function, and eighth graders created "animools," inspired by surrealism, for which the boys used observational drawing skills to combine an image of a tool and an animal. 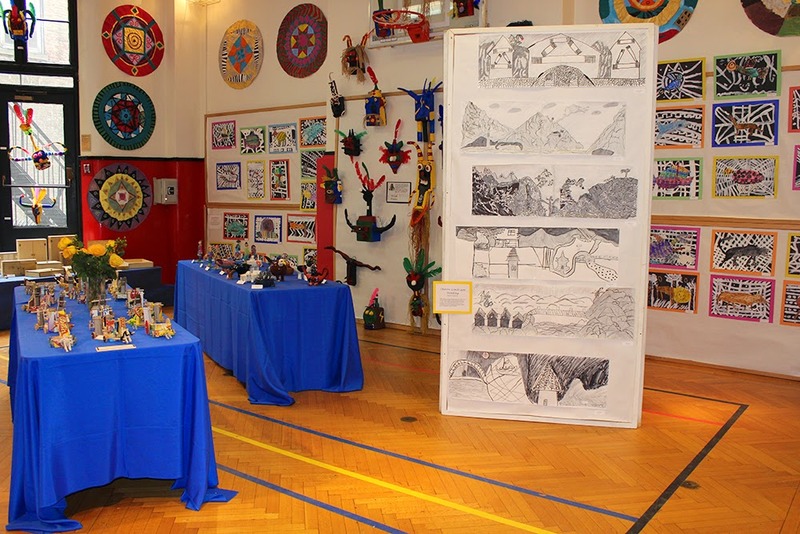 These and all the other fine examples of our boys' understanding, talent, and creativity in woodworking, art, and pottery are on display through May 29. Thank you to Ms. Boccella, Ms. Fidler, Ms. Frassinelli, and Mr. Sunderwirth for their phenomenal work with our boys throughout the year, and for mounting this wonderful show. 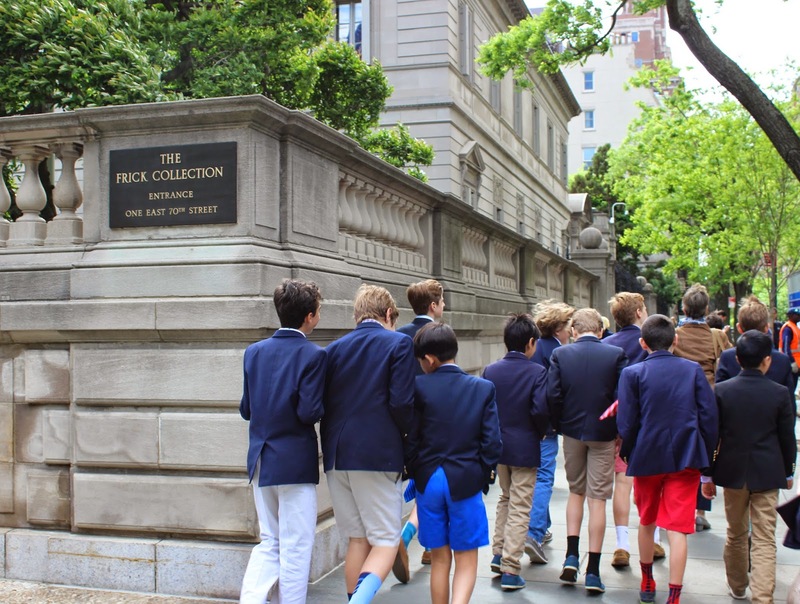 Today, on the quick bus ride back to school after a morning session at the Frick Collection, the sixth graders expressed how much they had enjoyed their visit. "I loved it! I wish that we could have stayed longer," said more than a few. As many a parent who has visited a fine art museum with their children can attest, this is a response one can only dream of. However, taking the boys out of the classroom and into a place where they are free to express and exchange their views and insights with peers, and then having them go back, take what they learn and create something, is a game changer. This morning I accompanied art teachers Jenna Boccella and Hannah Frassinelli and their sixth grade students on a session at the Frick Collection. In this new collaboration between Saint David's and the Frick, the boys participate in a guided tour provided by museum docent and current Saint David's parent Olivia Birkelund Gerard, of portraits that relate to the boys' portraiture unit in art class. The works we viewed included Bellini's St. Francis in the Desert, Holbein's portraits of St. Thomas More and Thomas Cromwell, and Lawrence's Lady Peel, and we ended with an arresting self portrait of Rembrandt. As we gathered in front of each painting, Mrs. Gerard elicited impressions and observations from the boys, who eagerly participated, offering their ideas about symbolism, use of light and color, and the intent of the artist. When the boys were prompted to compare and contrast the two Thomases painted by Holbein, which flank the fireplace in one room, a boy opined of the Cromwell: "This guy looks fake, so evil, like he wants to kill the other guy." The session also included discussion surrounding the significance of certain elements of portraiture painting, including props, setting, expression, angle and placement, and how the boys might incorporate these in the self portraits they are currently creating in art class. I was impressed with the depth of the boys' engagement throughout the session and their animated discussion. It was refreshing to see how each idea or thought expressed by one boy could spark the engine of ideas in another boy, and how a painting, such as Lady Peel that at first glance might seem "happy," after a generative exchange of observations reveals a more nuanced and somber character. I believe that in order for our boys to appreciate art they have to both see the original in person as well as create art of their own. 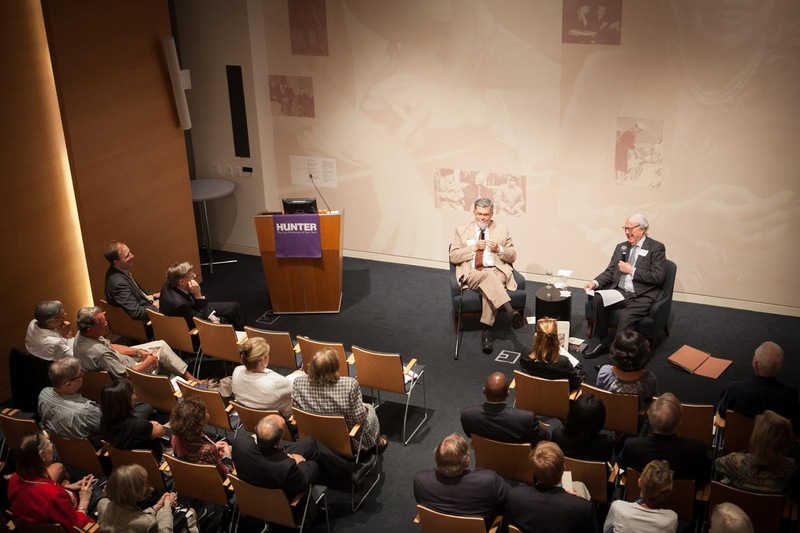 Exposure and communication with the work in situ is vital, as are partnerships between and among cultural institutions that provide experiences with experts in a field. This morning's spring concert filled a packed Hyman Hall with music performed by our Philharmonic Ensemble, Percussion Ensemble and Chamber Singers. The boys in the Ensemble, conducted by Philip Hough, were up first with renditions of "The Entrance of the Queen of Sheba" (Handel) and the second movement from "Symphony No. 1 in D Major "(Mahler). Their performance was skillful, assured, and energetic. The Percussion Ensemble, with John Francis as Director, took the stage next. Their first piece, the contemplative "Um Tom" (Caetano Veloso) was performed in conjunction with the Chamber Singers. This was followed by "Stew for Three" (Barnett), featuring three Eighth Grade soloists, and "Technology" (Casella), a rousing mix of sound and rhythms. The concert closed with the beautiful singing of our Chamber Singers, directed by Phyllis Clarke. They performed their first number, "I am Singing" by Stevie Wonder, with lyrics in Swahili, Spanish and English (see video clip below). The boys then sang "Raging Fire" (Phillips) and ended the concert with "i thank You God " from e.e. 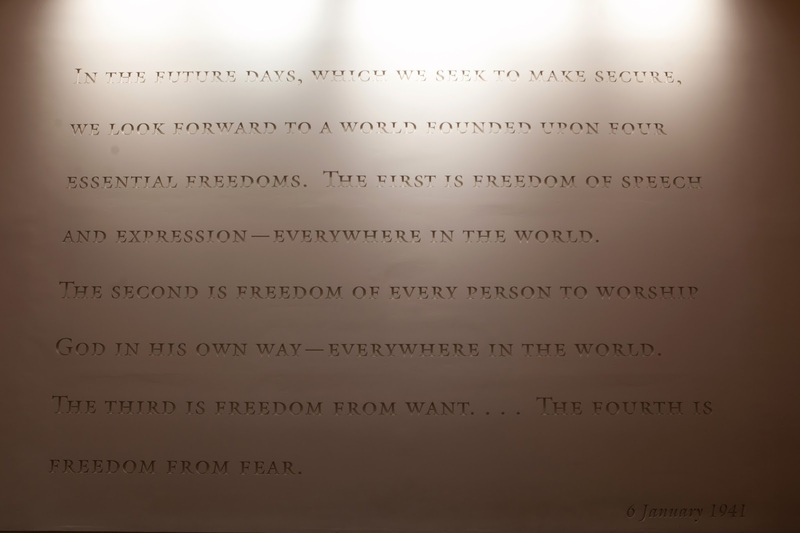 Cummings' poem (Levine). Each year I look forward to attending the spring concert. 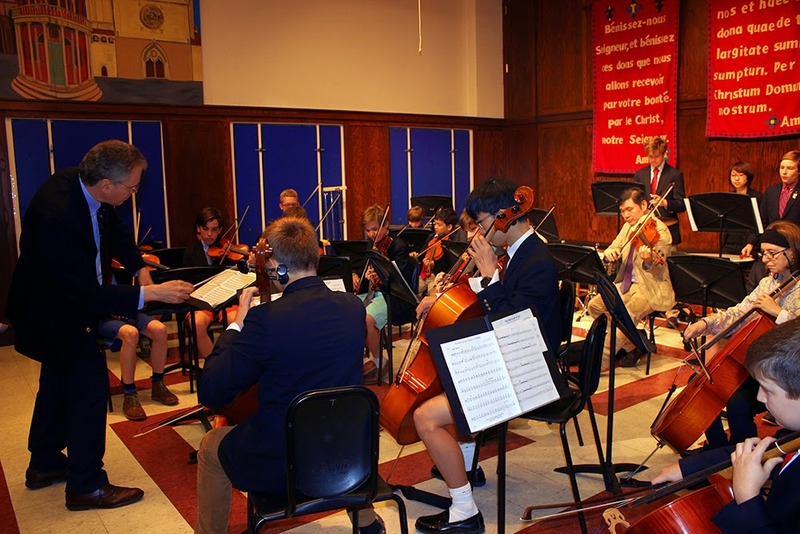 It is the opportunity for our young musicians, who have diligently practiced all year, to showcase their accomplishments to the delight and appreciation of their teachers, classmates, and parents. Saint David's Varsity Lacrosse team players are MPMSL Champs again! Coached by Bernie Evangelista and Anthony Russo, the team won the Manhattan Private Middle School League title again this year, finishing the season with an overall 9-1 record, and an undefeated 5-0 within the league. Theirs was the seventh MPMSL Lacrosse title in the school's history. The coaches and I are proud of the boys. Not only did they successfully defend their title, more importantly, they did so as skilled players and good teammates who embrace the ideal of honoring the game. 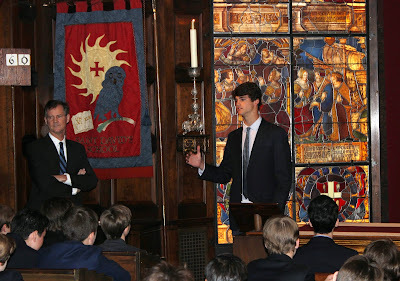 This morning, former Student Council President Colin Johnson '11 and his father, Jim, gave a Chapel talk to our 7th and 8th graders. Both were members of the Saint David's contingent that visited Ethiopia last June for the official opening of the Saint David's Kalina School. 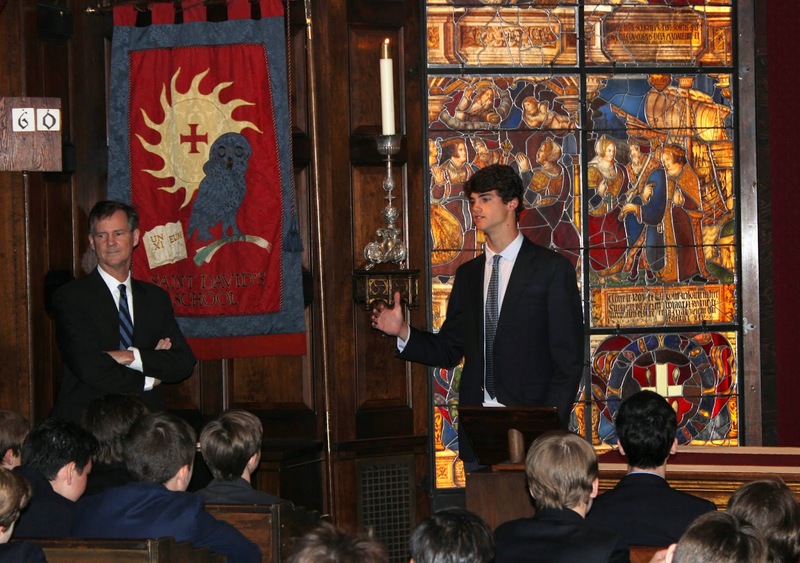 Colin, Student Council President at the genesis of our Dollars for Ethiopia Scholars initiative in 2011, opened the talk by telling the boys about the project's background. He had been brainstorming with his fellow eighth graders about their class's community service initiative when I suggested building a school in Ethiopia, as a meaningful project to undertake during our school's 60th anniversary celebration. Colin and his student council officers would spearhead the effort, which would entail a multi-year commitment from the school and our boys. Colin relayed how his initial reticence about such a large undertaking soon gave way to excitement as the fundraising efforts got under way with an extremely successful first year, and two successive years that raised enough for us to complete construction of the first school building in 2013. He then focused on the trip we we all made in June 2014 to Tigray, Ethiopia, to officially open the school. "It was like a homecoming—there was something waiting, tangible and real, that I had had a hand in creating. It was an awakening, and finally the distant vision we had set our sights on in 2011 became a reality. 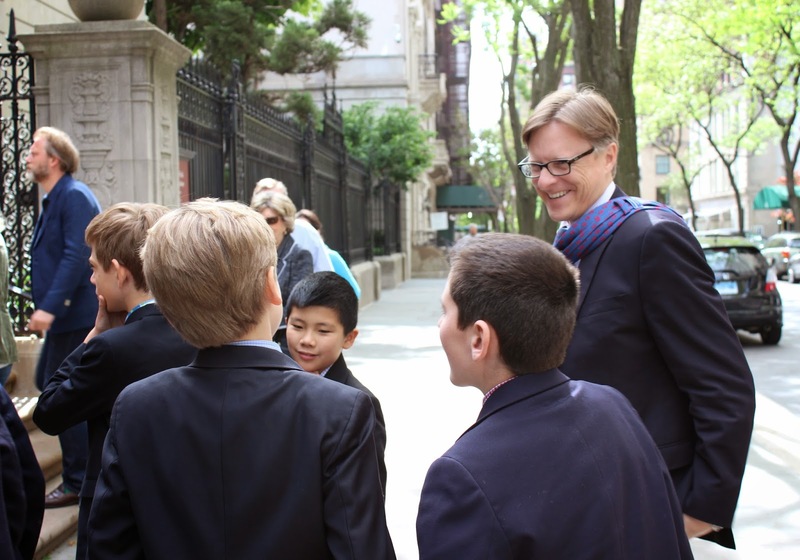 When I saw the sign on the side of the Saint David’s Kalina School 'A gift of the Saint David’s School Students, New York City, 2013' I thought about you guys and every Saint David’s boy." Jim spoke of what had impressed him most on the trip: "how little the people of Ethiopia have in the way of basic goods, running water, and electricity, and yet how happy them seem to be; how excited they were to meet us, talk to us, and share their lives with us." 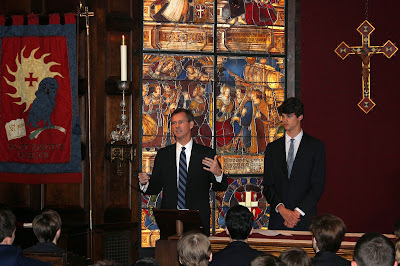 He also was moved by their extreme gratitude for the Kalina School and told the boys in Chapel how much we all can learn from the Kalina community and from a project such as this. Colin concluded the talk by recounting an interaction he had with a young Ethiopian boy on a flight we took from Meleke to Addis Abba. The 11- or 12-year-old boy was leaving his family to continue an education in the country's capital because schooling in his village stopped after the sixth grade. Colin observed that despite this difficulty, "the boy was completely content and understood his obligation to his village to make the most of the opportunity that had been given to him. He changed the way I thought about going to school every day, and at the end of the plane ride he handed me an Ethiopian prayer charm that will never leave my bedside table." Both Colin and his dad stressed that there was more to be done to help provide education to the children of the Kalina community. 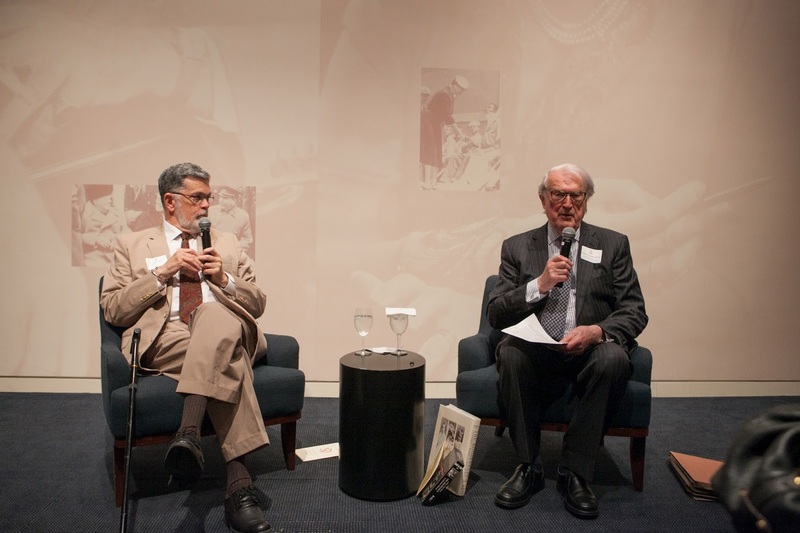 It was terrific to see Colin and Jim at school today; and their talk was a great inspiration to our current seventh and eighth graders who, along with all of our boys, continue their efforts in support of the Kalina community's education needs. Our Eighth Grade boys are at an exciting culminating point in their DNA unit, now working in small groups on a DNA analysis project that will answer a research question of their choice. Questions posed by the teams include: Do the herbal and fruit teas from Teavana contain what they advertise? What is the composition of four different brands of hot dogs? Does a sample of catfish contain parasites? What are the different varieties of moss in Central Park? Recently, the boys extracted DNA from samples of the substances they are investigating. Next, they will perform gel electrophoresis and analyze the results. They will present their findings to boys in younger grades in June. 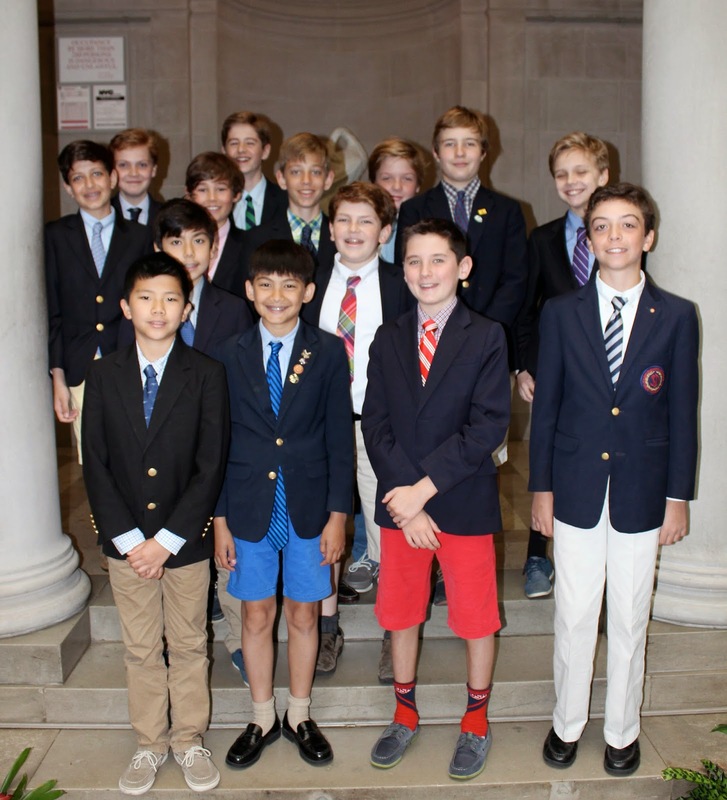 This inquiry-based unit, conducted in an expanded partnership with the DNALC (last year we introduced a program in the Fifth Grade), harnesses boys' natural curiosity about the world around them. It enables our boys to engage in hands-on work with actual DNA scientists to generate ideas that will solve real-world problems. Last week I had the honor of dubbing our third graders "Knights of Saint David's" in the annual Medieval Knighting Ceremony held in our school Chapel. These boys are nearing the end of their time in the Lower School and this ceremony stands as a rite of passage in which they accept their call to be leaders. 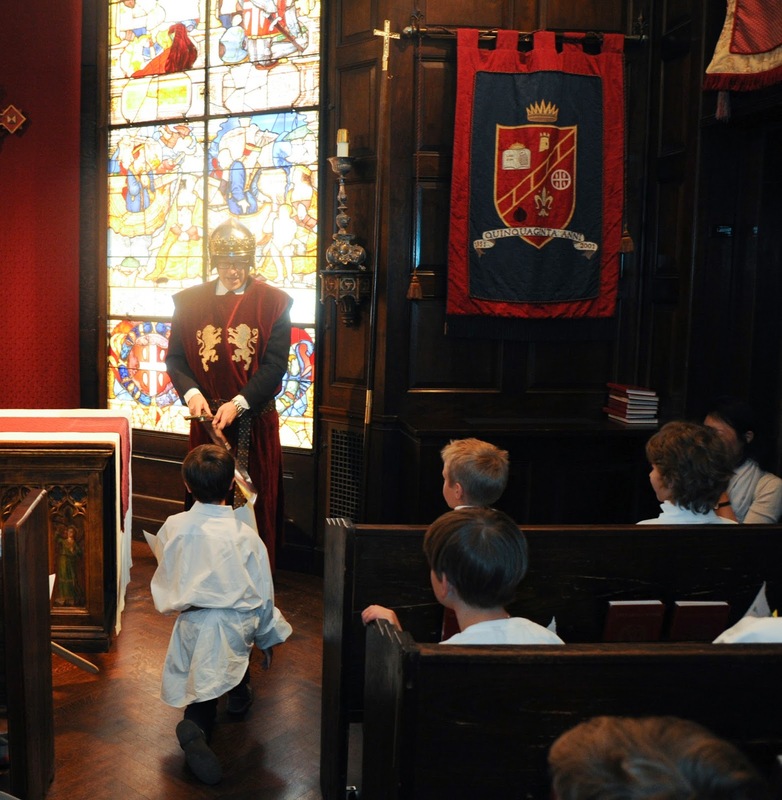 The boys prepare for this ceremony through interdisciplinary learning about Medieval times. They read a variety of fiction and non-fiction books related to the Middle Ages, go on a quest throughout the school in which they demonstrate characteristics of good men and knights, and write original fairy tales set during the period. 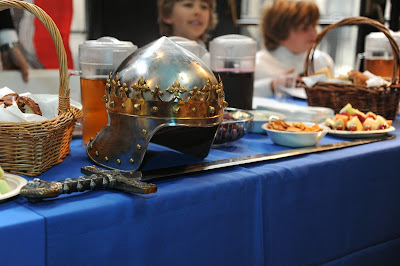 After the ceremony, we all adjourned to the small gym for a delicious Medieval feast, and entertainment via our recorder players, and our eighth grade jugglers, fencers, jesters, story tellers. 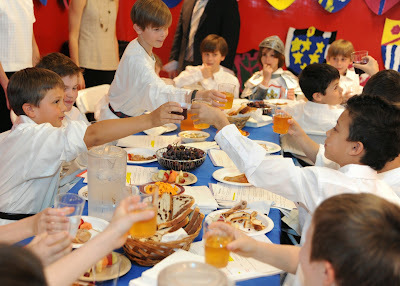 The boys had a wonderful time, as did all of the teachers present. 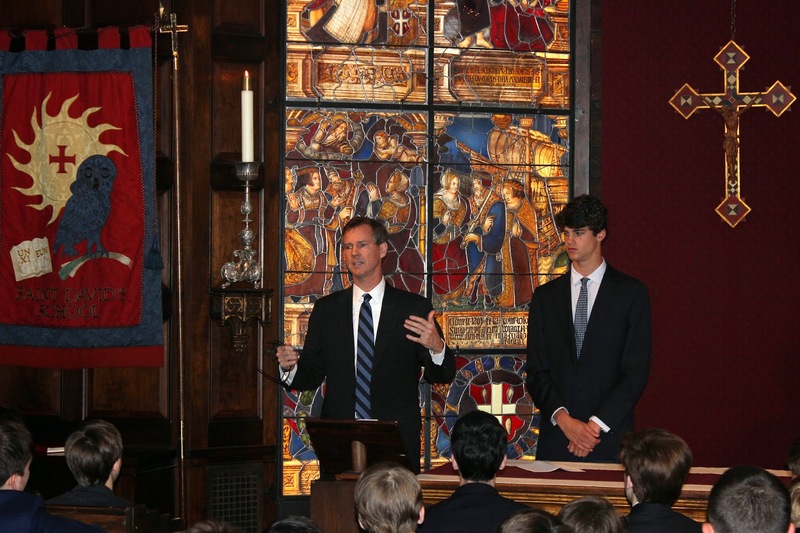 The day is brought to fruition each year through the work of so many, including the boys' teachers, our music department, and our dining services. Their efforts produce a marvelous, meaningful and memorable tradition that speaks to the ideals espoused in our mission and which also happens to be a great deal of fun. On Friday was the event that our Omega boys and their families have long been awaiting: The Omega Dinosaur Presentation! The boys performed with gusto, especially when divulging their favorite facts about Tyrannosaurus, Stegosaurus, Triceratops, and Pterodactyl. They also displayed songwriting talent, having written the verses for one of the numbers. 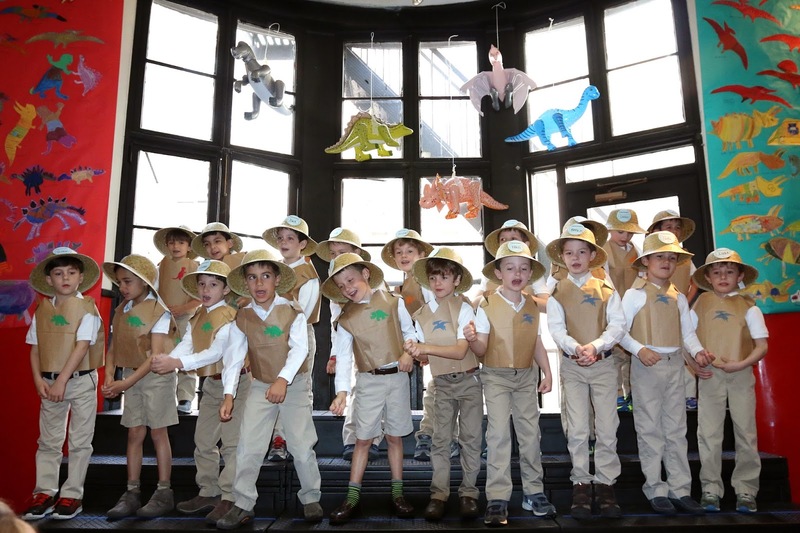 This wonderful performance of "all things dinosaur" allows the boys to showcase what they have learned in their interdisciplinary study of the prehistoric animals. 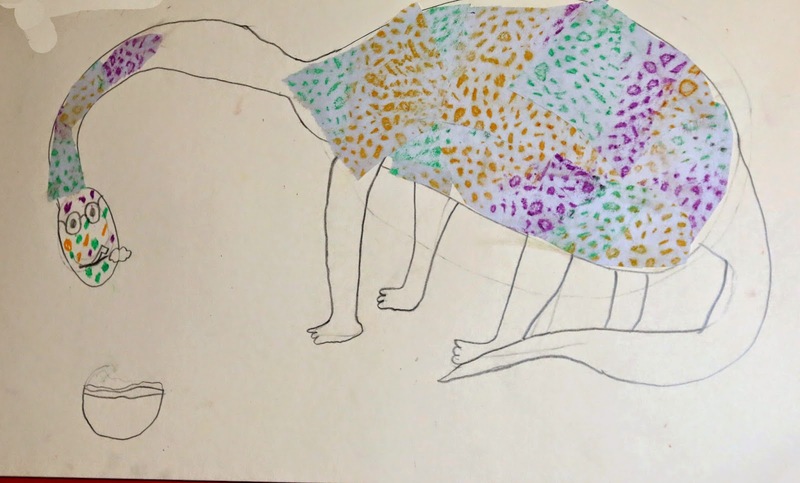 The unit included drawing dinosaurs in art, singing about dinosaurs in music, learning about fossils, and acting as paleontologists in the American Museum of Natural History's Dinosaur Hall. And it all culminated Friday morning. 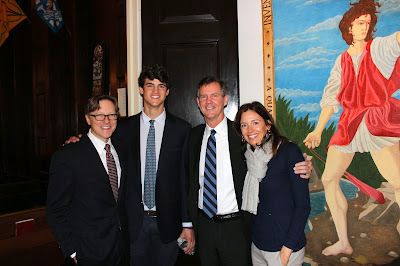 The boys' parents and teachers have much to be proud of. It was a great show! This past Sunday, Saint David’s own house band, Cascade, rocked the Rockwood Music Hall in New York City, sharing the bill with The Blazers from St. Bernards. The band members are Julian C., guitar and vocals, Finn D., vocals, Brij G., piano, Sean O., drums, Charlie U., guitar/vocals, and Teddy W., bass. The band, which has been practicing every Friday afternoon at our school, presented eight songs for the standing room only audience. Among them were a beautiful rendition of Stand By Me, by the late Ben E. King, and Purple Haze by Jimi Hendrix. As Music Chair Jeff Moore reports, "Each member of the band soloed in at least one tune, and their professional polish was evident to all who were in attendance." The band is coached by Mr. Ben Kogan, who teaches guitar and piano at Saint David's.